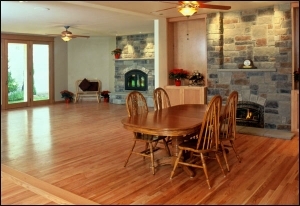 A spacious family room was added on to an existing family room and the existing room turned into a dining room. 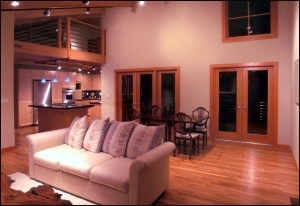 The stepped down rooms gives them a feel of separation from the kitchen, yet the matching of the hardwoods, woodwork and design let the rooms flow together. The warm fireplaces with the old world stone look give the rooms a focal point and draw you to them. The doors along the back wall of the family room open out onto the private backyard. 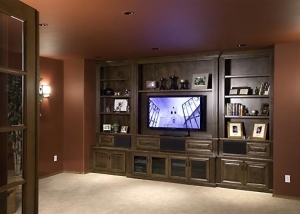 This small room received a small addition that made an enormous change. The rooms before had flat dark stained cabinets on either side of a painted over brick fireplace. The new picture shows an attractive, comfortable room that ties into the kitchen and makes both rooms a great living place. On the left of the picture, the wall was bumped out two feet and windows added to capture a view and bring in light. Cabinets were added below the window to create both extra seating and storage. 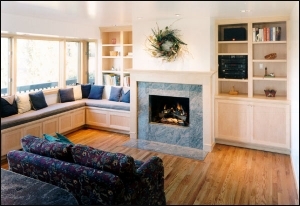 Handsome cabinets were added to both sides of the fireplace which was re-surfaced in sheetrock and marble and capped with a mantle to create a beautiful focal point for the room. New recess can lights were added to highlight the bookcases and fireplace, and the floors re-done in oak hardwood to add elegance and warmth to the whole room. This master bath opens off the master suite with dramatic double glass doors. The drama doesn’t stop there. The heated marble floor leads up a set of stairs to a large jetted tub overlooking the private back yard. Not shown in this picture are the spacious separate sink areas and the private toilet room. 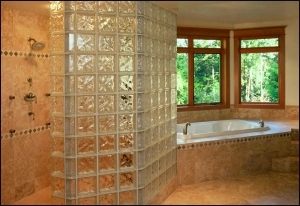 Walk into the custom shower area with dual showerheads and full body massage controls. 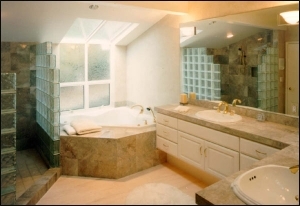 The creative use of in-laid marble, wood windows, millwork, lighting and wall colors make this a truly dramatic bath. 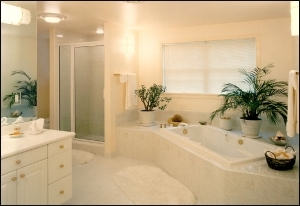 Added on to an original Magnolia bungalow, this bathroom suite included the use of soft lighting and light colors to create a warm and glamorous bath with lots of space to move around in and enjoy. The quality of fixtures and finishes along with the layout make this bath a place to where you can truly indulge yourself. The before picture shows a standard builders grade bathroom with a carpeted floor. 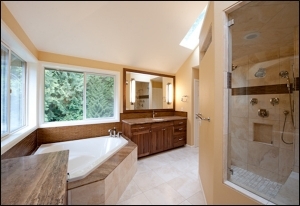 The new bathroom is fitted with a walk-in spa/steam shower, a heated tile floor, beautiful granite counters and a tile backsplash to add interest and appeal. The high quality finishes give this bathroom a polished look. This elegant and exciting kitchen was made possible by removing a wall between a small family room and the old kitchen, adding a large window for natural light, spectacular granite counters, fir cabinets, state of the art appliances and slate floors. The space was transformed from a cramped kitchen to a large space where family and friends love to gather. This kitchen tied in with the rest of the home—large, spacious and elegant with lots of windows and skylights to bring the outdoors in. 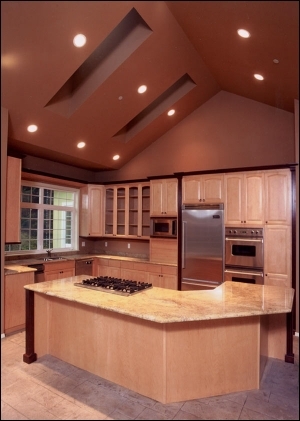 The state of the art appliances, along with numerous cabinets and working space, make this kitchen a cook’s delight. 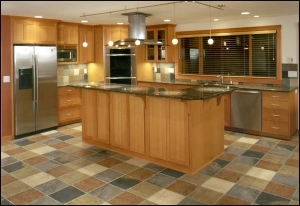 Its creative use of colors—from the maple cabinets, slab marble counters, stamped concrete floors and rich colored walls—make this a beautiful and inviting space.